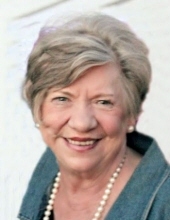 Mrs. Eva Nancy Nuttall Gray, age 76, of Cedartown, GA passed away on Monday, November 6, 2017 at her residence. Nancy was born in Cedartown on February 20, 1941, the daughter of the late Arthur and Esther Nuttall. She was also preceded in death by her brothers, Arthur Nuttall, Jr. and Richard Nuttall. Nancy was a graduate of Cedartown High School and Limestone College in Gaffney, South Carolina. She received her Master of Education degree from West Georgia College in 1997. She was a member of St. Andrews Anglican Church in Rome, GA and a life-time member of the Cedartown Junior Service League. Prior to her retirement, she had been employed for 26 years at Darlington School in Rome where she was head librarian. Nancy enriched the lives of many people through her generous heart, her joyful spirit, and her unwavering faith. She loved her family- especially their annual beach trips together; her church; her Dachshund Lillie; and travelling with Lloyd and their friends. Survivors include her husband Lloyd H. Gray to whom she was married on August 10, 1963; daughter Anne (Keith) Jennings of Clairmont, GA; daughter Meg (Issac) Jenkins of Oxford, MS; and son Trippe (Jennifer) of Birmingham, AL. She had a very special place in her heart for her seven grandchildren- Alex Anne and Meggie Beth Jennings; Zac, Gray and Ruthie Jenkins; and Davis and Caroline Gray. One sister-in-law, Maryann Nuttall also survives along with a niece and several nephews. The family will be receiving friends Wednesday, November 8, 2017 from noon until the memorial service hour. A memorial service to celebrate Mrs. Gray’s life will be conducted Wednesday, November 8, 2017 at 2:00 PM in the chapel of the Smith & Miller Funeral Home with Father Austin Goggans officiating and Rev. Issac Jenkins delivering the eulogy. In lieu of flowers, the family requests that memorials be made to St. Andrews Anglican Church, 3 Central Plaza #175 Rome, GA 30161. The Smith & Miller Funeral Home of Cedartown is honored to serve the family of Mrs. Nancy Gray. To send flowers or a remembrance gift to the family of Nancy Gray, please visit our Tribute Store. "Email Address" would like to share the life celebration of Nancy Gray. Click on the "link" to go to share a favorite memory or leave a condolence message for the family.